Description: This is a relatively large and stout bodied goby which is easily recognised by its distinctive coloration. The body is reddish-brown with lighter and darker blotches and the lips and cheeks have vivid red markings, hence its common name. Lines of black sensory papillae are visible on the head. Adult fish can be up to 18cm in length. 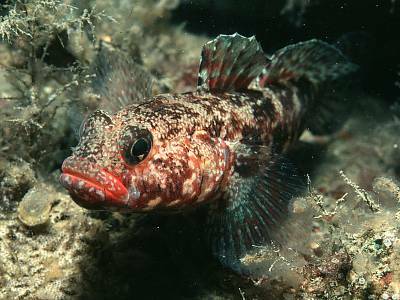 Habitat: In south-west Ireland the red-mouth goby is usually found among rock and boulders in sheltered inlets at depths between 10-20m. In the Mediterranean it is often found in eel-grass beds. Distribution: This species is rare in the seas around Britain and Ireland and so far has only been reported from two inlets on the south-west coast of Ireland, Lough Hyne, Co Cork and Kenmare River, Co Kerry. Similar Species: The red-mouth goby is easy to identify due to its distinctive coloration. Picton, B.E. & Morrow, C.C. (2016). Gobius cruentatus (Gmelin, 1789). [In] Encyclopedia of Marine Life of Britain and Ireland.